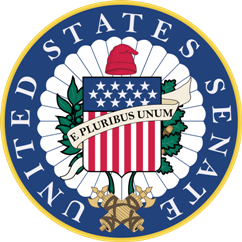 Will There Be a Record Number of Woman vs Woman US Senate Matchups in 2018? With the appointment of Minnesota Lieutenant Governor Tina Smith to replace Al Franken in the U.S. Senate this January, the number of women in the chamber reached an all-time high water mark of 22. Multiple reports have shown women are running for prominent political office at a record rate this cycle – but will there be more women in the U.S. Senate during the 116th Congress next January? In addition to Smith, 11 other women in the chamber are running for another term this November, including potentially vulnerable incumbents such as Democrats Claire McCaskill of Missouri, Heidi Heitkamp of North Dakota, and Tammy Baldwin of Wisconsin. [Less vulnerable are Republican Deb Fischer of Nebraska and Democrats Dianne Feinstein of California, Mazie Hirono of Hawaii, Elizabeth Warren of Massachusetts, Debbie Stabenow of Michigan, Amy Klobuchar of Minnesota, Kirsten Gillibrand of New York, and Maria Cantwell of Washington]. In order to offset potential losses that could cause a drop in the number of female U.S. Senators, female challengers will also need to run successful campaigns, and one way to ensure the number of women in the U.S. Senate will not decline after 2018 is to maximize the number of states in which women win both major party nominations. There has been at least one woman vs. woman U.S. Senate matchup during each of the last six election cycles dating back to 2006 (with 11 of these contests in total). In 2016, for example, Maggie Hassan unseated Republican Kelly Ayotte in New Hampshire, while Kamala Harris beat Loretta Sanchez after the two Democrats emerged from California’s nonpartisan top-two blanket primary system. 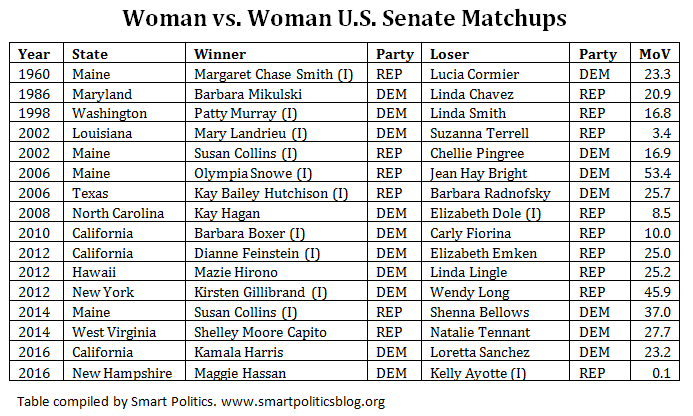 There have been a total of 16 woman vs. woman matchups in U.S. Senate electoral history, but only four of them did not involve an incumbent. Looking ahead to November, it is quite likely that the 2018 cycle will easily set the record for the most matchups between two female major party nominees. Arizona: Senator Jeff Flake’s open seat is poised to bring the country its fifth U.S. Senate matchup between two women without an incumbent. Three-term Democratic U.S. Representative Kyrsten Sinema is a shoo-in for the Democratic nod while two of the top three candidates for the GOP nomination are also women: two-term Congresswoman Martha McSally and former state senator and 2016 candidate Kelli Ward. Ward was an early front-runner, but her support may now be splintered on primary day, losing votes to perhaps the most famous (ex-) sheriff in the country – Joe Arpaio, who joined the race in January. Just two women have received major party U.S. Senate nominations in Arizona history: Democratic community activist Claire Sargent in 1992 (lost to Senator John McCain) and Democratic Congresswoman Ann Kirkpatrick in 2016 (lost to McCain). New York: Well-funded two-term Senator Kirsten Gillibrand could face a female Republican nominee for a second consecutive cycle. Last month, Republican fundraiser Chele Chiavacci Farley announced her candidacy to unseat Gillibrand in the deep blue state and seems situated to win the GOP nomination, barring a last-minute filing by a notable Republican candidate before the April 12th deadline. Gillibrand defeated Wendy Long by 45.9 points in 2012 and would become just the second woman in history to face a major party female opponent in a U.S. Senate race twice, joining Maine Republican Susan Collins. [Collins defeated Democratic nominees Chellie Pingree by 16.9 points in 2002 and Shenna Bellows by 37.0 points in 2014]. Massachusetts: First-term Senator Elizabeth Warren has one prominent woman vying for the GOP nomination to try to unseat her this November – Beth Lindstrom (former executive director of the Massachusetts Republican Party and Director of Consumer Affairs and Business Regulation under Governor Mitt Romney). With an incumbent sitting on more than $14 million cash-on-hand through December, Lindstrom faces difficult odds in picking up the seat for her party despite a popular GOP governor at the top of the ticket, but she does have a good chance to give Massachusetts its first U.S. Senate matchup between two female major party nominees in state history. Nebraska: The primary deadline has passed for challengers to line up against first-term Senator Deb Fischer, and Democrats expect Lincoln City Councilwoman Jane Raybould to be their party’s nominee. Prior to Fischer’s victorious 2012 campaign, three women had landed major party U.S. Senate nominations in the state: Hazel Abel in 1954 (won special election), University Board of Regents member Nancy Hoch in 1984 (lost to Senator Jim Exon), and communications executive Jan Stoney in 1994 (lost to Senator Bob Kerrey). Wisconsin: First-term Senator Tammy Baldwin has only nominal opposition in her party’s primary, but may face Republican State Senator Leah Vukmir in the fall. Only one woman has won a Republican Wisconsin U.S. Senate major party nomination: State Senator Susan Engeleiter in 1988. Engeleiter came up 4.5 points shy of picking up William Proxmire’s open seat as Herb Kohl won his first of four terms. Aside from Engeleiter and Baldwin’s debut senate campaign in 2012, the only other women to appear on a primary ballot for the office in Wisconsin are Democratic national committeewoman Gertrude Bowler in 1934 (placing last in a five-candidate primary field with 12.9 percent) and Treasurer Cathy Zeuske in 1994 (placing third of four candidates with 17.0 percent). Vukmir appears to have made the race for the GOP nomination competitive against businessman Kevin Nicholson – her chief rival among candidates who have officially filed for the race in advance of the June 1st deadline. Minnesota (special): Candidates have nearly three months yet to file to challenge appointed Senator Tina Smith and one Republican who was early to join the fray is State Senator Karin Housley. In addition to incumbent Amy Klobuchar (victorious in 2006 and 2012 and the presumptive 2018 nominee for the state’s Class I seat) two other women have won major party nominations in the state: DFL Secretary of State Joan Growe in 1984 (losing to Senator Rudy Boschwitz) and Ann Wynia in 1994 (losing to Congressman Rod Grams in an open seat race). Minnesota Republicans have yet to nominate a woman for the office. California: While Dianne Feinstein has had a rough few weeks – failing to win her party’s endorsement (or that of Bernie Sanders) she seems assured of placing in the top two slots of the nonpartisan blanket primary in June and advancing to the general election. The other spot will probably be won by State Senator Kevin de León, although a long shot on the ballot is a former teacher and national director of an anti-political corruption PAC – Alison Hartson. Like Senator Gillibrand, Feinstein also faced a female opponent during her last contest in 2012 (Republican Elizabeth Emken). Overall, the cycle with the most U.S. Senate elections with two female major party nominees is 2012 with three: Feinstein vs. Emken in California, Hirono vs. Lingle in Hawaii, and Gillibrand vs. Long in New York. Four other cycles have had two: 2002, 2006, 2014, and 2016. Other women who have a good chance to win seats in 2018 (against male nominees) are Tennessee Republican U.S. Representative Marsha Blackburn (open seat) and Nevada Democratic Congresswoman Jacky Rosen (Senator Dean Heller). Next: How Often Do Parties Flip US House Seats in Specials Where They Previously Did Not Field a Candidate? 2 Comments on "Will There Be a Record Number of Woman vs Woman US Senate Matchups in 2018?" 1. “…Smith to ‘replace’ Al…” True, it is a rather common term. Still, it seems more appropriate to use ‘succeed/ succession’ when describing transitions of this nature. 2. AZ: I may be wrong here, but should both McSally and Sinema both advance to the general, it would the FIRST time (anywhere) that 2 incumbent FEMALE US representatives face off against each other in a general election for the US Senate (!?). 3. CA: Bernie (IN? D? / VT) not endorsing “Di Fi” seems odd, considering that he is backing (as far as is known publicly) Senators Baldwin and even Heitkamp, both of whom have (relatively) less liberal voting records than the senior CA senator. As for Alison Hartson, it would be most noteworthy if she manages to finish ahead of the highest-performing R candidate in the initial round of voting in June. #2. You are not wrong – it’d be the first such time.